“Is it 12 o’clock yet?” Marcel was trying to read himself to sleep, and I kept asking until he said yes. “Happy birthday to you, happy birthday to you, happy birthday my darling Marceeeeeel, happy birthday to you” … and then five minutes later in Dutch, and five minutes after that in Afrikaans …we won’t even go down the route of what the French sounded like. YES, I ADORE BIRTHDAYS!!! Especially when it’s my honey’s. Instead I fried up some bacon, onion and tomatoe; chiselled a frozen baguette; added a layer of cheese and popped it in the oven. Topped off with a fried egg. And freshly squeezed orange juice. Not with a juicer. No sirree. With a manual lemon squeezer! Paps would be proud. Marcel spent the day working on the latest “Muddy’s Bootcamp” video and using his kitty GPS for warmth, Mado followed every ray of sun. I cooked and cleaned and felt like a slave. Albeit a willing, bouncy Tigger kind of slave. Around 4pm I’d finished doing the dinner prep, and had vacuumed and mopped the floors. I have to say it, “laminate flooring is way easier to maintain than ceramic tiles! !” After my shower, I decided to walk down to the village. Marcel didn’t have any beers, and more importantly, we needed candles for dinner! With all this R&R my pants have become inexplicably tighter, so a little bit of “fresh air” wouldn’t do ANY harm!! I bumped into Sidsel … it’s so nice knowing people, and fabulous people at that. We confirmed plans for Sunday and parted ways. I popped into the Spar and got a six-pack of Kronenbourg, dinner candles and tealights – turns out they’re very handy for starting fires! Further up the road, the bakery was still open. What’s a birthday celebration without a little cake? Forgetting the pressure on my waist line, I boldly walked in, smiled, said “Bonjour” and then asked, “avez vous un petit gâteau”? Huh? Was that me? Those online lessons in Holland have helped!!! “Biensûr!” I bought two tartlets and walked out grinning like a Cheshire cat. On the way back up the hill, I found a little path to get me closer to the waterfall. Wearing a Provencal poncho is not ideal for bundu-bashing. It got caught in every “wag ‘n bietjie” [wait a bit] vine. No wonder I normally wear simple, practical clothes … it served me well in the Croatian forests during the 4×4 trophies. Slow roast and champagne … hmmm. Okay, a sparkling rosé – but a local Carpe Diem bubbly. A welcome gift from Derek and Maggie (thanks, again). In Pen’s lovely champagne glasses. With dinner candles. 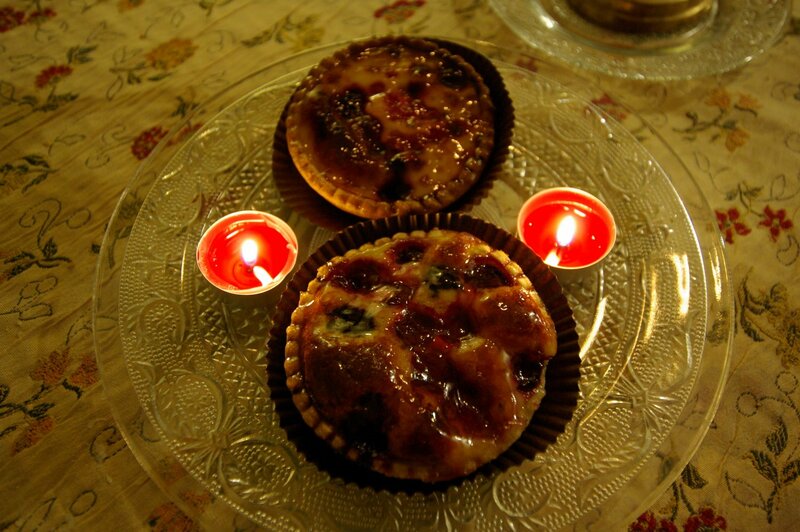 The tartlets, when compared to supermarket prices, were pricey … but considering the taste, the flavours, the nuances .. isn’t it better to pay for quality than for quantity? Eat less, appreciate more 🙂 Vive la France! ps. did you know that our surname “Koning” is Dutch for king, like roi in French?